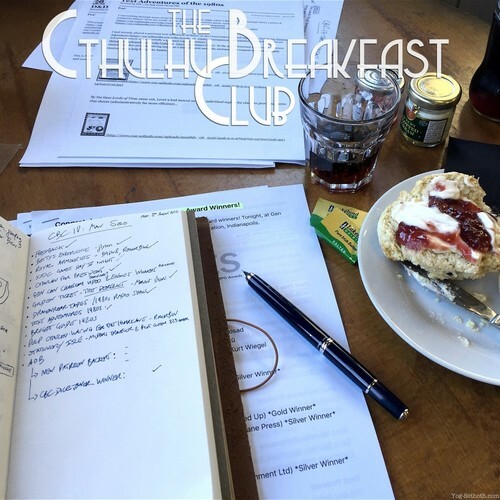 The August 2016 edition of The Cthulhu Breakfast Club. The Bettys experience, YSDC Games Day V, ENnies 2016, the Golden Ticket game, Panacea, Pulp Cthulhu: Waiting for the Hurricane, Chaosium Gen Con 2016 seminar, The Curse of Nineveh, Dragonroar and D&D tapes, 1980s text adventures, 1920s guide to Bruges, the Stationery Isle and other sundry topics. Recorded at Pickles Tea Rooms, Baildon.